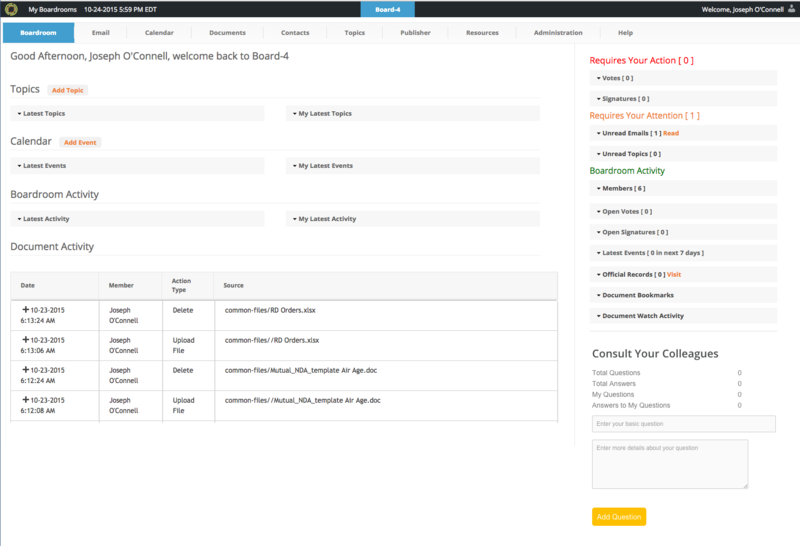 An executive summary dashboard that provides the user at a glance where he or she may need to focus their attention. Things like unread emails, pending votes and/or signatures, latest topics for discussion, upcoming events, etc. A business class email account for each member with an outlook like client that provides enterprise grade spam and virus protection, a feature rich email composer and address book. Unique capability like Board Member email accounts marked in “Red” for identification and all email correspondence continuously archived to a professional eDiscovery component. Each Office of the Board has its own “theboard@” email account for general correspondence with the Board. 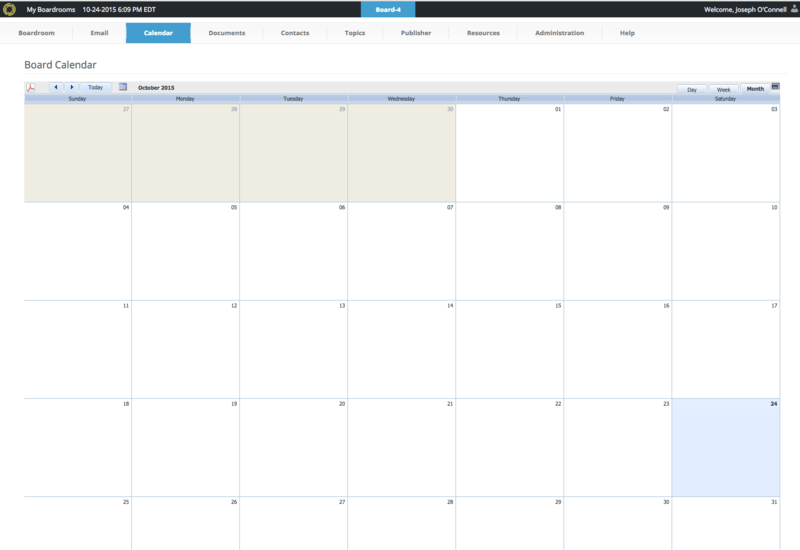 A Board specific event driven calendar with single and recurring event management. 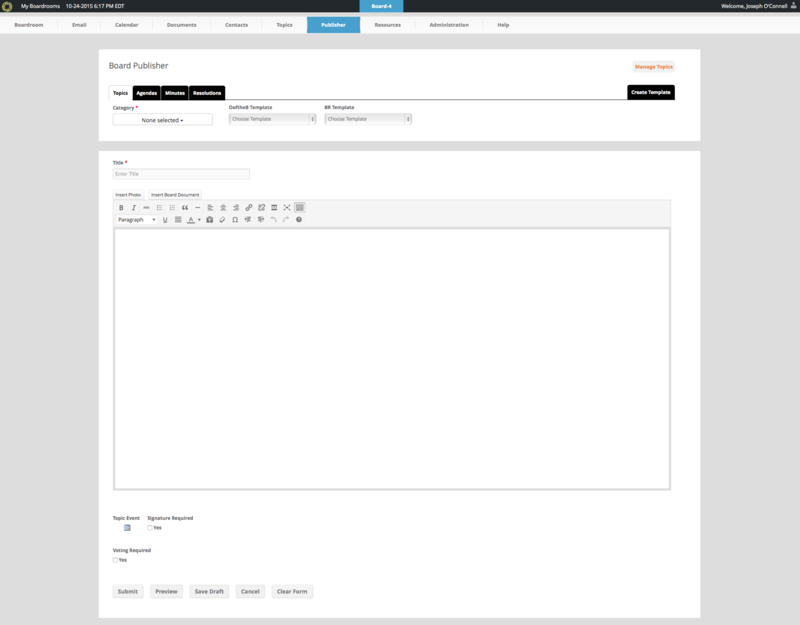 With day, week and monthly views you can add event titles, descriptions and URLs to your entries. 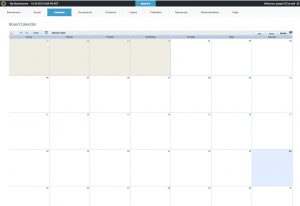 Integrated with other Boardroom features that automatically post events to the calendar. Printable at any time for any period as a PDF. With its state of the art document manager Office of the Board will provide its members with organization, access and share ability. 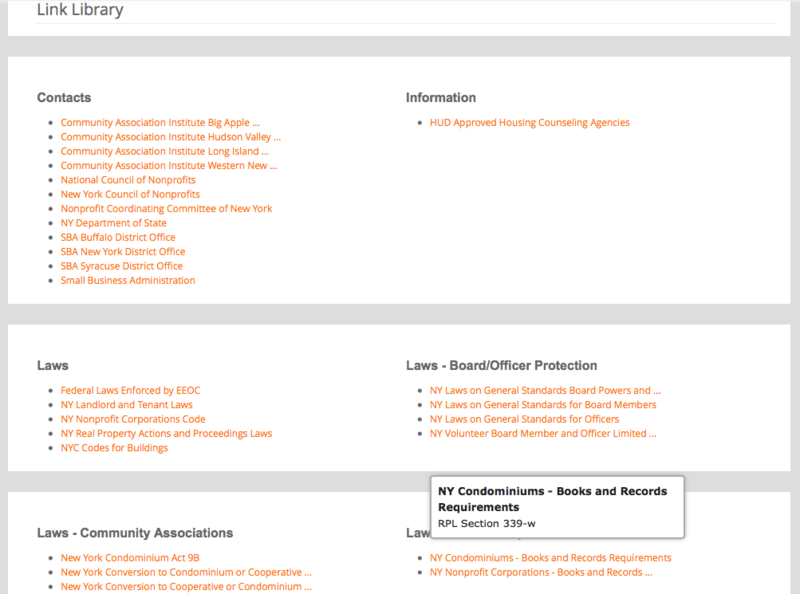 The Official Records section is automatically configured when the Boardroom is established providing predefined folders by entity type and legal jurisdiction. The folders themselves provide information as to whether the folder content is legally required or just best practice. If you are concerned about deletion of documents Office of the Board comes with a Double Authorization setting so documents cannot be purged without final approval by a member with Double Authorization authority. 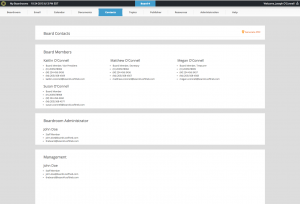 A Boardroom specific centralized contact address book automatically populated based on Office of the Board user’s profile. Printable at any time as a PDF. A collaborative space where board members can carry on an over-time discussion of any subject drafted from the Publisher. Each topic contains the ability to provide discussion based comments and can include electronic signature requests and voting if required. Each Topic can be converted to a PDF for printing or saving to the Document Manager, or deleted according to a retention policy. 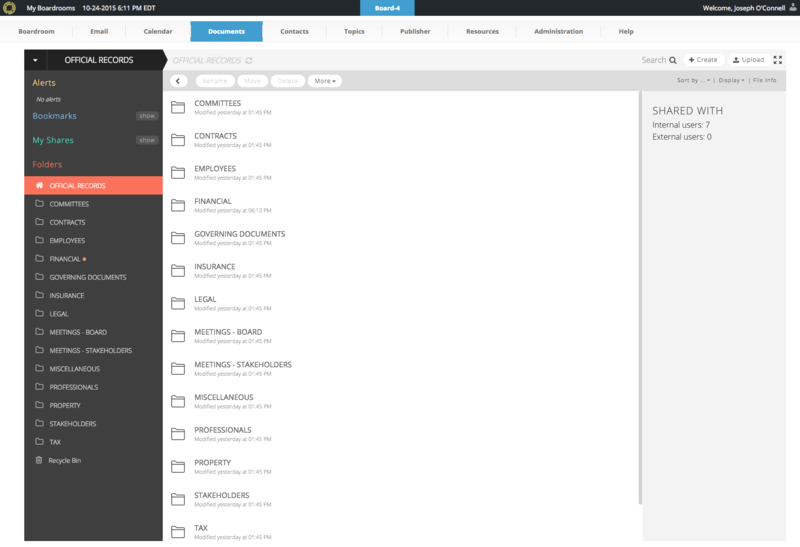 All topics are completely searchable. Drafting and publishing topics or specific documents could not be easier. 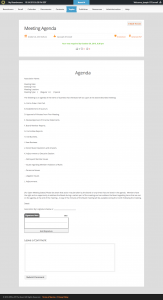 Discussions, Agenda, Minutes, Resolutions, Unanimous Written Consents and more can be easily published to Topics for review, comment, e-signature and voting all within the Boardroom itself. If Office of the Board’s repository of various document templates is not enough we provide the ability to create your own templates from ours or from scratch. 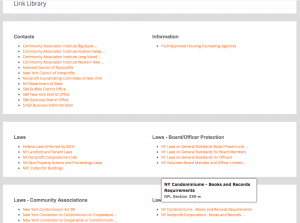 A library of resource links that is automatically configured when the Office of the Board is established based on entity type, legal jurisdiction and other variables. Members of all experience levels can use the links library as an educational and practical resource. 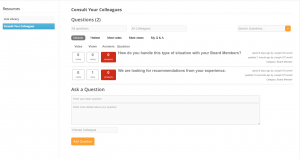 The Consult Your Colleague resource is available to Board Members and Presidents. Permitted members can consult with Board Members and Presidents of other Offices of the Board about familiar topics and obtain advice. 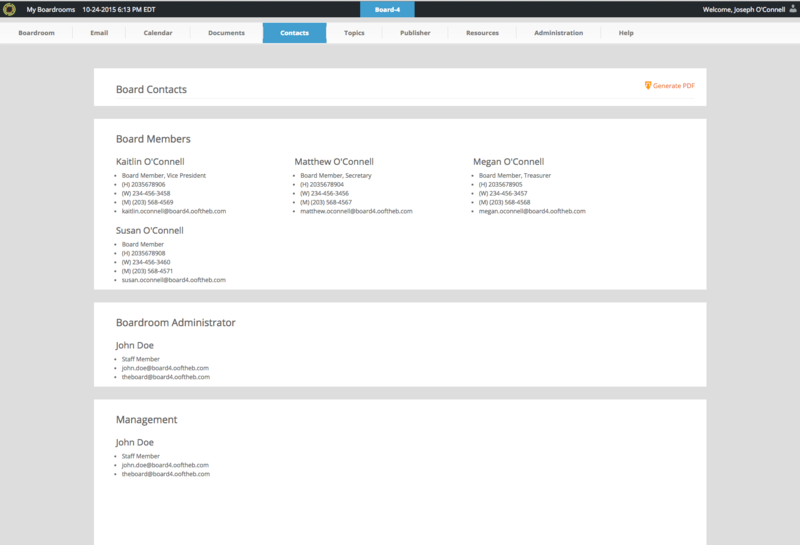 A full administrative panel to easily configure and manage your Office of the Board. From adding members, to allowing or denying access to features, to adding new email accounts, creating new affiliations and positions to managing Policies. 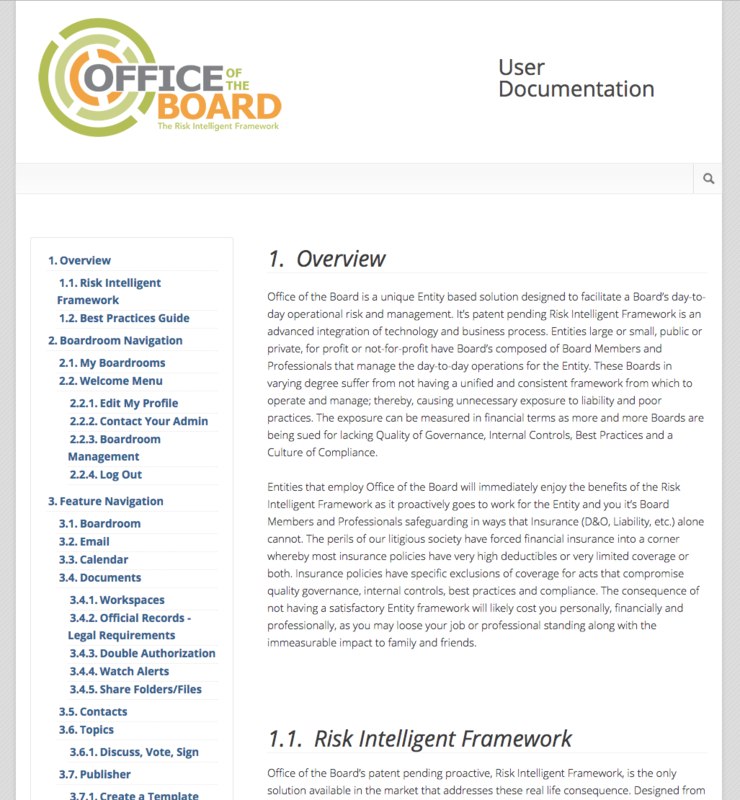 Office of the Board provides the granularity to configure your Boardroom to your specification. 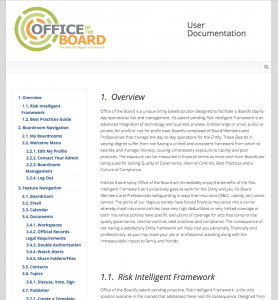 A complete help system at your fingertips, searchable and intuitive with screen shots to help guide the way making it easy to learn and take advantage of all that Office of the Board has to provide. Policies can be modified as required to account for legal or other requirements. 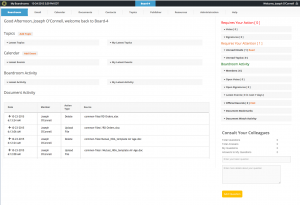 Administrators and other permitted members can fully manage their Office of the Board including adding, deleting, disabling members, setting permissions, functionality, features, etc. 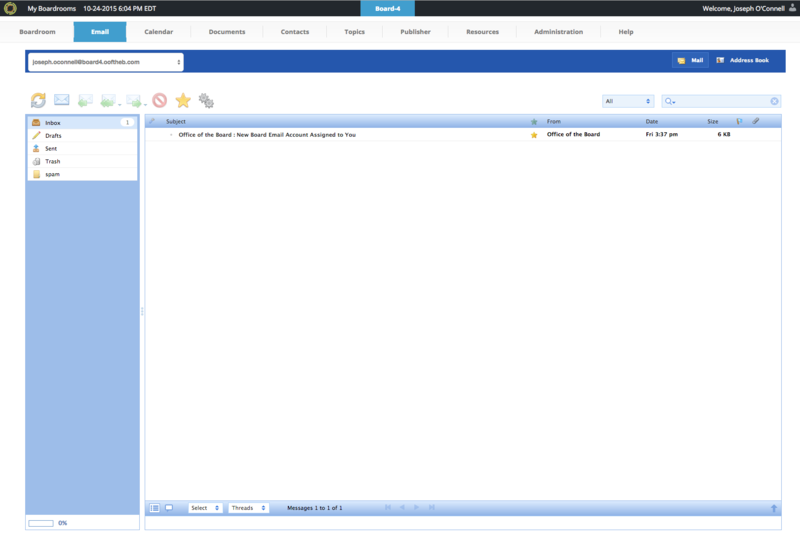 All workspace, folder and document activity is logged including uploads, deletes, modifications, views, logins, etc. 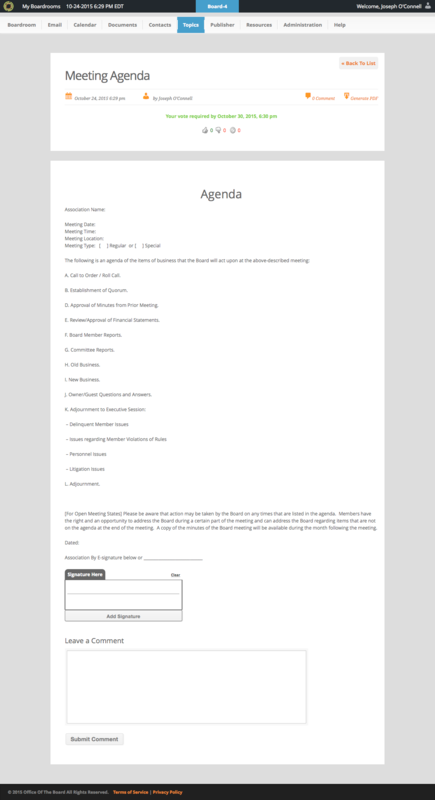 Publish Topics include discussions, documents like agendas, minutes, resolutions, unanimous written consents, etc.